Dow Corning 789 Silicone Weatherproofing Sealant is a one-part neutral cure, construction grade sealant that easily extrudes in any weather. It quickly cures at room temperature by reaction with moisture in the air to produce a durable, flexible silicone rubber seal. Ease of application ready to use as supplied : No catalyzing or mixing required. All-temperature gunnability consistency in virtually unchanged from 37C to +71C permitting the sealant to be applied in any season to dry, frost-free surfaces. Suitable for use on masonry substrates and will not react with or corrode most building components. 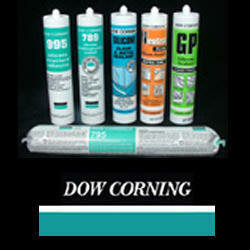 Good weatherability like other Dow Corning silicone building sealants, it is virtually unaffected by sunlight, snow, ozone or temperature extremes. Established in the year 1998, we “Pioneer Engineering Co.” are the most accomplished trading company and supplier of Industrial Self Adhesives Tapes, Packaging Tapes, Double Side Tapes, masking tapes, Silicone Sealants, adhesives, application guns and other FMGC products Our quality product coupled with competitive prices and prompt customer service has helped us to achieve the maximum degree of customer satisfaction. We have always delivered the right product to our customers. A perfect combination of Quality - Customization - Innovation with value engineering, all this has resulted in our growth & success. "The best quality every time and any time"